While I was out of town about a week ago, Celine at Have Cake Will Travel started a mad scientific experiment with bagels. 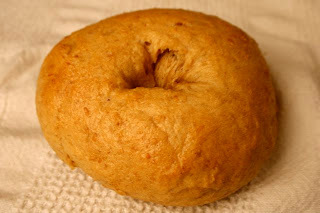 I am a huge bagel fan! Then she went and put beer in her freakin' bagels. I mean, really, like I wasn't going to try this. I know this will shock some of you, but I do not like to drink beer...I just don't like it (the illustrator thinks there is something seriously wrong with me). However, I love it cooked/baked in things. I don't know why, but I do! (I know you all think much less of me now!) So, when I saw these recipes she kept throwing out there, I knew I would have to try them! So, I finally got a few minutes to myself and I threw together a batch for myself. I was so shocked at how easy they were! I have to be honest though and tell you that I had no doubts that they would be good...flour, beer, sugar...need I say more? They were perfect! What impressed me the most was that she simplified the recipe for those of us who do not have bread machines (I have one...it just happens to be missing in action at my mother-in-laws house). I am anxious to try the pumpkin flavor now since I found some interesting looking pumpkin beer at the store the other day! Dang I love the fall! Now, I know that you can just as easily go to the store and buy bagels (heck, it's probably even easier to go to the store). However, there is something to be said for baking food from scratch at home. I love that these look so "organic" and I don't have to look at the packaging to find out what kind of funk they have put in them! I am the type of person that can spend hours in a bakery just looking at the different shapes and colors of the breads. I love the smell too, so for me to be able to make things like this from scratch, to enjoy any time I want to is very comforting! I love that these look so "organic" . By that, I mean I am the person that likes things to look more homemade! I like good old fashioned looking treats! You know...not so perfectly frosted cakes or in my case not so perfectly shaped bagels. Also, this one in particular, without the perfect hole in the center, is going to make a mighty fine bagel pizza! I have threatened everyone in this house not to touch it...IT IS MINE! I followed Celine's recipe for making the bagels by hand. 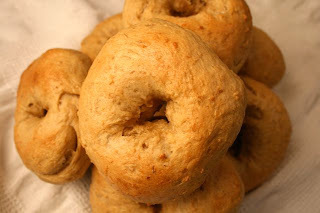 This is the Double Mustard Bagel recipe, but I chose not to put the mustard in them because I wanted the flexibility to put sweet or salty with them! I followed the recipe for making them by hand and it is really simple! Thanks, again, Celine for another great recipe! Trust me, I have plenty of other vises, beer just happens to not be one of them! Thanks for the understanding though! I need to get some vital wheat gluten. I am anxious to see how that works in my breads! The bagels were great but not drinking beer is a sin in the Church O' Tony. Repent! Hey Sarena - Did you try the Smart Balance margarine in these? Let me know if you do anything with Splenda in them as well. They look great - now I just need the time to make some!!! Mimi - I did use Smart Balance and I think I may use Splenda next time. I am also going to try them without beer next time...just to see how we like it. The beer definitely adds something to it! 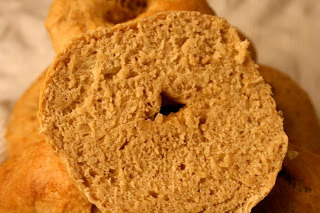 Also, I need to find some vital wheat gluten to try in my yeast breads...it keeps them from getting stale so quick! I know why you like beer cooked in stuff - yeasty, carby beer? C'mon... you are a carb trollop if ever there was one. I know the truth!!! I plea the 5th here! I am what I am though...that is all I can say! I Feel It In The Air!